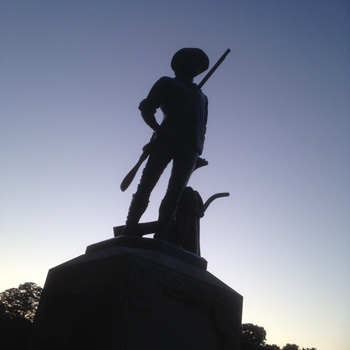 We drove out of Boston through Cambridge and into Lexington -- not exactly the same route that those 700 Redcoats marched early in the morning of April 19, 1775, but pretty close. 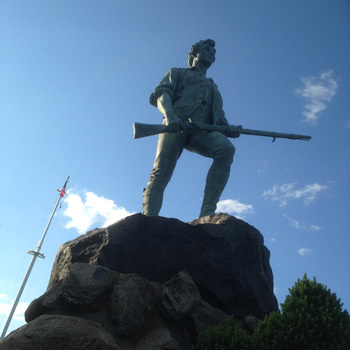 I knew it was coming, but I was still kind of surprised when we came up on Lexington Green and the statue of the minuteman facing us, right where those farmer-militia provincials faced several hundred ornery British soldiers who had been marching all night. 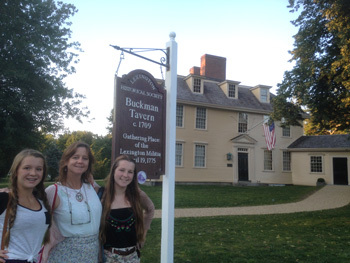 We parked right by Buckman's Tavern, where the gunpowder was doled out to the militiamen. The ladies headed out to find a good place for dinner while I headed across the street to the Green. "Have fun history-ing," Ellie called as I ran off. 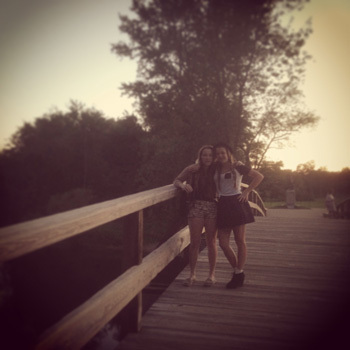 After our Thai dinner, we drove on westward and reached the Old North Bridge in Concord, just about dusk.